Based on the novel The Home Invaders: Confessions of a Cat Burglar by John Seybold (under the pseudonym Frank Hohimer), Thief is the story of a safecracker who decides to go straight upon completing one more diamond heist only for everything to go wrong. Written for the screen and directed by Michael Mann, the film is a look into a thief who is known for his professionalism as he deals with the dangers of his profession as he is eager to start a new life. Starring James Caan, Tuesday Weld, Robert Prosky, James Belushi, Tom Signorelli, Willie Nelson, and Dennis Farina. Thief is an entrancing and gripping film from Michael Mann. The film follows the life of a safecracker who has decided to end his life of crime to focus on living a cleaner and safer life but a crime boss offers him a job that would make him rich as he copes with what the job will do for him but also if it can really set him free. It’s a film that is really more of a character study of a man that does have a couple of businesses that he runs in a bar and in a car dealership yet he makes great money in being a safecracker. Yet, when a fence who is supposed to pay him is killed and unable to give the safecracker named Frank (James Caan) his money. Frank learns that his dealer owes money to a crime boss in Leo (Robert Prosky) who wants to offer Frank a job to steal diamonds in California. The job would allow Leo a chance to not just get the money he’s owed but also so much more including a way out of the life of crime as he had been to prison and doesn’t want to go back. Michael Mann’s screenplay follows the world that Frank lives in as despite his legitimate businesses, he is at his best when he is opening safes and steal its goods while maintaining a low profile as he answers to no one. Still, he has endured so much trouble and wants to stay away from trouble just as he’s getting his life going upon meeting and dating a restaurant cashier in Jessie (Tuesday Weld). He also has this idea of a dream he wants to do of a life outside of crime and major responsibilities that he wants to share with Jessie as there is this scene at a diner that is seven-minutes long where Frank talks about this dream he has with a picture he had been carrying. A man in that picture is his mentor Okla (Willie Nelson) who is incarcerated for his time as a safecracker but has a chance of getting out. For Frank to do that, he has to take Leo’s job offer as he and his friend Barry (James Belushi) go to California to do this job. The second act isn’t just about Frank accepting the job but also trying to get things the right way as he also has to deal with corrupt cops. The third act is about this heist but also its troubling aftermath. Mann’s direction is rapturous for the way he creates an atmosphere of a man in his element as a safecracker as the first seven minutes showcases Frank breaking into a safe with a drill and hammer with great attention to detail. Shot largely in Chicago with some of the film shot in California, Mann would maintain a tone that does bear elements of film noir as much of the action is shot at night with very little scenes shot on a sunny day. Mann’s usage of wide shots do play into the locations yet he aims for something more intimate in the fact that the film is character-driven with Frank in nearly every frame of the film whether he’s having this conversation with Jessie about his life in a seven minute scene filled with monologues or a meeting with Leo at a restaurant with its medium shots and close-ups. Much of the film’s first two acts are driven mainly by suspense and drama with little emphasis on action as it play into the planning of this big heist in California. Mann’s direction is also intoxicating for the way he builds up this slow attention to detail into how a heist would work but also Frank’s desire to make sure that Jessie wouldn’t know too much despite telling her what he really does. The climatic heist is also a slow build in not just what Frank, Barry, and their friend Joseph (William LaValley) do but also the tools and such they need to open a vault. It’s an amazing sequence that has Mann be patient in his approach as well as what is in the vault. The aftermath as it relates to everything Frank is given and what he wants do come into play where it’s not just violent but also play into the idea of loyalty in the world of crime which is something Frank has a problem with. It would lead to a showdown that is intense but also chilling in the way Mann approaches every shot in what is to come as well as the attention to detail into Frank’s professionalism. Overall, Mann creates a mesmerizing and riveting film about a safecracker trying to go straight while being asked to do one more job. Cinematographer Donald Thorin does incredible work with the film’s cinematography with its usage of low-key lighting for some of the interiors as well as scenes set at night with its emphasis on stylish lighting as it’s a highlight of the film. Editor Dov Hoenig does excellent work with the editing as it help play into the rhythm of the suspense in its pacing as well as some stylish cuts for some of the action and drama. 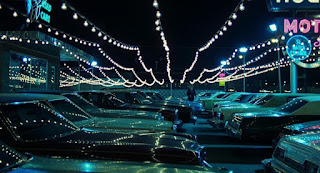 Production designer Mel Bourne, along with set decorator John M. Dwyer and art director Mary Dodson, does amazing work with the look of the home that Frank would get from Leo as well as the bar and his car dealership as well as the room where the big vault for the film’s climax is presented. The special effects of Russel Hessey and Doug Hubbard is terrific for some of the film’s action scenes as well as a few moments in the heist scenes. Sound mixer David M. Ronne does superb work with the sound in the way a drill sounds in breaking into a safe as well as other objects that help play into the suspense and action. The film’s music by Tangerine Dream is brilliant for its electronic-based score that has elements of somber and moody pieces along with eerie cuts that play into the suspense while a score piece by Craig Safan for the film’s final moments is intense in its art-rock sound as the soundtrack also includes some Chicago-based blues in a few scenes in the film. The casting by Vic Ramos is wonderful as it feature some notable small roles and appearances from William Petersen as a bartender at a blues bar, Dennis Farina as one of Leo’s hoods, Patti Ross as Barry’s girlfriend Marie, William LaValley as an associate of Frank’s in Joseph, Hal Franks as Frank’s fence Joe Gags who didn’t inform Frank about the money he owes to Leo, and Tom Signorelli as Leo’s right-hand man Attaglia as a low-level crime boss that refuses to give Frank his money as he would get in touch with Leo to deal with Frank. Willie Nelson is superb in a small but memorable performance as Frank’s mentor Okla as a man that is incarcerated as he’s dealing with ailments prompting Frank to get him out of prison legally. James Belushi is fantastic as Barry as Frank’s friend who works as a mechanic at Frank’s dealership while also aiding him in the heist as he also hopes the job would give him a good life. Robert Prosky is excellent as Leo as a crime boss who offers Frank a major job with a big payday as he also helps him get a few things where it is clear what his motives are as it play into the ideas of loyalty and greed. Tuesday Weld is amazing as Jessie as a cashier waitress at a restaurant Frank falls for as she is suspicious about his attitude towards life while learning about what he does as she tries to help him start a new life. Finally, there’s James Caan in a tremendous performance as Frank as a safecracker who runs a dealership and a bar that is eager to go straight until he’s not given the money he’s owed as it’s a performance of intensity but also with an air of calm and restraint as a man who has been through too much and is eager that this one job will be his last as it is Caan in one of his best performances. Thief is a spectacular film from Michael Mann that features an incredible performance from James Caan. Along with its ensemble cast, gorgeous visuals, riveting screenplay, offbeat suspense, and a hypnotic score by Tangerine Dream. The film is definitely an early major achievement from Mann that would showcase his approach to crime and man dealing with his situations as it is also this engrossing character study that isn’t afraid to show flaws in the decisions that a man makes. In the end, Thief is a phenomenal film from Michael Mann. Nice review! I have not seen a lot of Mann's films. I should probably change that some day. LOVE this movie, but damn, I haven't seen it in years. Your review is a great reminder that I need to check it out again. @Brittani-I've seen a lot of his films as I'm hoping to do some re-watches since they're always so interesting. @Alex-Right now, this is definitely one of my favorite films of his so far as I need to get the Criterion DVD/Blu-Ray. Besides, it was better than I thought it would be as I've put Mann in my shortlist consideration for next year's Auteurs series. I would LOVE to see you tackle Mann on your Auteurs series. This is a sleek, slick, stylish thriller that has the substance to back it up as well. Mann shows an assured touch even this early on in his career with a career-defining performance from Caan. I also love Weld in this and how she plays off Caan. And a rare role of Belushi's that I can actually stomach. Between this and SALVADOR, what happened to this guys? Good to see that Lynch dusted him off and got him to deliver the goods in TWIN PEAKS. @J.D. Lafrance-Glad that you enjoyed this film as I was enthralled by it not knowing what to expect. There's a bunch of films by Michael Mann I'm planning to re-watch and do proper reviews on while watching the few that I haven't seen. James Belushi I think is doing fine as I wish he would get more work as he is an underrated dramatic actor.